In order to increase collagen synthesis in the body, we need to take 2.5g - 5g of collagen per day. While taking 2.5g per day will maintain your health, 5g will promote your health. If taking this amount through collagen rich foods, our bodies will need between 250g - 500g daily. It is impossible to eat 250g-500g a day of certain foods, such as: shark fin, pig’s feet, or chicken wings. Of course, we should refrain from doing this because these foods contain high levels of cholesterol. It is difficult to get the needed amount of collagen from your daily diet. 1.Collagens from animals are unhealthy due to the high fat content. 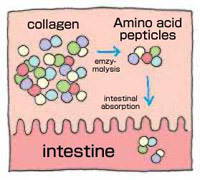 2.The optimum solution is to take collagen through a dietary supplement. 3.This simple and easy way to supply collagen while avoiding unwanted fats and calories. 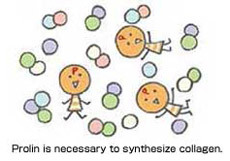 What is the Process of Collagen Synthesis in the Body? 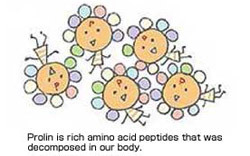 Collagen consists of many amino acids strands that are held together, which means that its molecule is quite large. 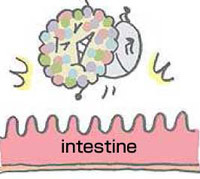 Once we take collagen, it is broken down by gastric juices, pancreatic enzymes, and enzymes found in the small intestine. Proline is an amino acid that is essential for the production of collagen and cartilage and is necessary for healthy skin, joints and tendons. Putting collagen directly on your skin has absolutely no effect. Collagen is expected to reduce skin irritation and provide moisture; however, it is said that collagen molecules are too large to be able to absorb into the skin.